The Hocking Hills region is filled with natural wonders you can’t find anywhere else. A visit to the Hocking Hills State Park will introduce you to countless hidden gems. One of our favorites is the famous Devil’s Bathtub. Although its eerie name may suggest otherwise, this is one of the most beautiful and captivating sights in the park. Discover even more things to do and places to see in our area when you access our complimentary Vacation Guide! What Is the Devil’s Bathtub? The Devil’s Bathtub is a fascinating piece of streambed. It consists of a unique tiered waterfall located between the Upper Falls and Old Man’s Cave. The tub is situated in a weak layer of Blackhand sandstone and is constantly enlarged by the swirling action of Old Man’s Creek. The upper part of the falls drops into a deep, bowl-shaped basin, forming a captivating whirlpool before dropping again into the large pool below. Legend has it that the pool extends deep into the depths of Hades, but it’s actually only a few feet deep! To reach the Devil’s Bathtub, start your trek at the visitor’s center and take the one-mile Buckeye Trail. This trail is the perfect distance for an afternoon stroll and offers numerous sights along the way. The first thing you’ll stumble upon is the Upper Falls, a gorgeous waterfall that cascades over the rocks. Continue your hike on the path towards the Devil’s Bathtub, find the stone bridge, and cross the stream directly above the basin. You’ll love the views! The Devil’s Bathtub only scratches the surface of all the hidden gems in the Hocking Hills State Park. This 2,365-acre park is home to awe-inspiring waterfalls, beautiful caves, and interesting folklore. The Inn & Spa at Cedar Falls is just minutes away, so make this a stop during your stay! Access our Hocking Hills State Park Guide for everything you need to know about the park. Get information on its history, hiking trails, and more! If you want to see the rest of the sites within the park, continue down the Devil’s Bathtub path until you see the A-Frame Bridge Over Gorge, Lower Falls, and Old Man’s Cave. You can also take the Buckeye Trail to Cedar Falls. We’re more than happy to give you recommendations for our favorite places to explore in the park! The Hocking Hills awaits! See the Devil’s Bathtub and more when you stay with us at the Inn & Spa at Cedar Falls. We are just moments away from the Hocking Hills State Park, so you’ll have easy access to all of the adventures it holds inside. 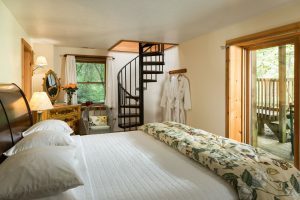 Browse our accommodations to start planning your stay; we have guest rooms, cottages, cabins, and yurts to choose from.Our property is the perfect place to unwind after a day in the wilderness! We can’t wait to host you.